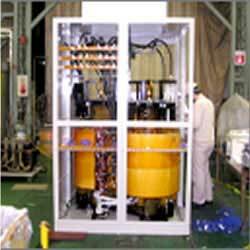 Transformers & Power Systems｜Products｜Tokuden Co., Ltd.
Tokuden can engineer and manufacture total systems for everything related to the electricity of main circuits, such as incoming current panels and reactor control panels. We deliver optimal systems quickly by using our unique power source technology know-how and development and production system capable of responding to special orders. 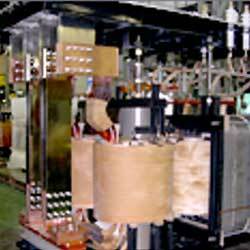 These reactors regulate the voltage in systems that must be reliable amidst volatile load fluctuations. You can depend on these reactors to run consistently for decades since they are wrapped with electrical steel coils and will not suffer temporary overloads the way that semiconductors can. They make it possible to produce small amounts with a small amount of kVA and large amounts with thousands of kVA, and current output can be controlled from 1% to 100%. Moreover, saturable reactors are equipped with the ability to keep the current constant even when the load fluctuates. These reactors are ideal power sources for metal, glass fiber or silicon melting furnaces, heat-treating furnaces for rubber, and so on. Regular transformers have set voltages and capacities, but Tokuden can manufacture special transformers that fit specific loads and specifications. We manufacture each special transformer separately with short turnarounds, and consider our clients' demands for voltage, current, rating, cooling, operating systems, and a host of other specifications. Combining these special transformers with saturable reactors enables you to control the voltage and current under any conditions. Glass melting furnaces send electric currents through groups of glass spheres, melt them, and force them through fine holes to create glass fibers. 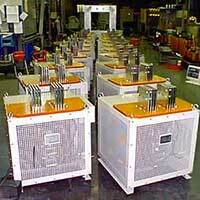 The transformers used in this process supply furnace electrodes with large currents for melting the glass. 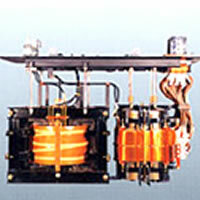 Tokuden transformers for glass melting furnaces are electrically and mechanically sound and do not falter amidst large current fluctuations. Electroslag remelting (ESR) furnaces use the resistance heat from molten slag to melt and refine metals for iron and steel manufacturers. This process requires a power system to control the large, unstable, low-voltage currents anywhere between 10,000 and 30,000 amperes caused by melting slag. 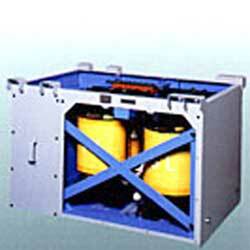 Tokuden offers a highly reliable system that controls currents using saturable reactors. Tokuden's prolific knowhow, cultivated through work with special power equipment, shows up in transformers for large motors used at water purification plants. 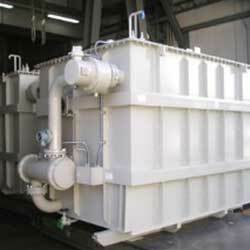 The transformers adjust agitation frequency and speed in response to the condition of the activated sludge and control systems such that their disposal output is always maximized. 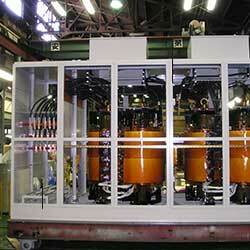 Tokuden transformers provide large motors used at these kinds of plants with optimal power and contribute to streamlining operations and conserving energy. 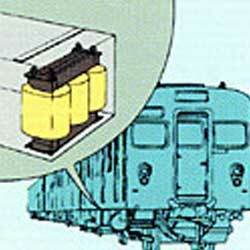 Inverters control the speeds of trains and adjust temperatures for heating and cooling systems. 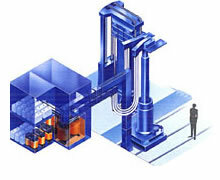 Tokuden's reactors relay the alternating current produced by inverters to the motor and other places in smooth waves and protect circuits by maintaining ideal electrical conditions at all times. We can install the reactors on the floor or on the ceiling so that they are not exposed to vibrations, the elements, or impacts from stones and other foreign objects. Our reactors are being used in Linear Motor (Maglev) Cars and many more of Japan's rail transit vehicles, a testament to their excellence.